Last summer our family went on a camping trip to Mactaquac Provincial Park in New Brunswick. Mactaquac is the site of a big dam that is built across the St. John River. It had never occurred to me before to wonder about the origins of the dam, or what it was like in the area before and during the construction of it. The Town That Drowned tells this story. 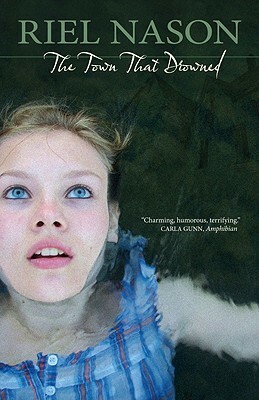 It is 1965, and 14-year-old Ruby has a vision of the whole town underwater after she falls and hits her head at a skating party. Soon after, the occupants of the town find out about the upcoming plans for building a dam, and that everyone within a certain distance from the river will have to move. As if Ruby’s life wasn’t already hard enough with her eccentric younger brother and her best friend moved away, she is now being ridiculed about her accident at the river and is more of an outcast than ever. Weird is a disease and once you have it you have it. I’m fourteen years old and infected for good. There’s no miracle cure. There’s no special prescription. I am quarantined all alone on the Island of the Odd. It’s a chronic condition. A lifelong affliction. And it really begins. The whole place moves past the point of no return. It’s like something changes in the air around here. It turns into a scary movie with spooky music playing in the background, and in floats this mysterious grey haze. People wonder, wait as if in a daze. My father says that this it what it feels like to know your whole life is someone else’s calculation, your family a number in a list on the page. This book is filled with quirky tales of the community and local gossip, while Ruby’s vision adds a touch of the mysterious. I find the tone of the book soothing and refreshing, told in the voice of a 14-year-old girl. The Town That Drowned takes us back to a time that doesn’t feel so rushed and immediate. There are no computers, cell phones, or Facebook; no video games or giant box stores. Instead, there are phones that attach to the wall, visits for tea and face-to-face conversations, painting, wood-carving, sending messages in bottles down river, and walking to the corner store for ice-cream. Read this book if you think you might be interested in a little New Brunswick history and what is involved in moving a whole community to build a dam. But also read this book if you want to experience “the awkwardness of childhood, the thrill of first love, and the importance of having a place, any place, to call home.” I know I am happy that I stumbled upon this book, and I’m looking forward to her next one! … for every inch the water wets, every blade of grass, every tree stump, driveway, foundation, rock, lawn, garden, it drowns a memory. Riel Nason grew up in Hawkshaw, NB, overlooking the St. John River, where she learned about what happened to the area before she was born. The Town That Drowned won the 2012 Commonwealth Book Prize, the 2012 Margaret and John Savage First Book Award, and the 2013 Frye Academy Award. On her website you can find some more background information about the author’s personal experience with the after effects of the flooding, which eventually led to inspiration for her first novel. Thank you for this review — another great-looking Canadian book that would have slipped under my radar if it weren’t for you!